The story of St. Joseph Parish, Ost, Kansas, encompasses the hardship of the first pioneers in this area, in the 1870’s and 1880’s, through grasshopper plagues, droughts, the Depression, the Spanish American War, two World Wars, the Korean Conflict and Vietnam. Through the Diligence of the pioneers, the sod was broken, and the open spaces of the Kansas prairies burst forth to provide their food and existence. Throughout the years and the continued efforts of its citizens, the Kansas prairies have become the “bread basket of the world”. Throughout its history, St. Joe farmers along with God and His church have been and continue to be, an integral part of this. The first settlers of Ost came originally from Westphalia, Baden and other places in Bavaria. A few families came from Switzerland. A wild country it was, to be tamed by the sweat of man’s brow. But what were hardships and toil compared to the farm to be gained and a family life to be established? So reasoned Friderick Ast, John Ast, George Erker, George Thiemmesch, Karl Schwaiger, Martin Leibel, Peter Bohr, Matt Bohr, Peter Marx, Sebastian Bugner, Nicholas May, John Cyskowsky and James Elsworth, the only Irishman in the group, settled here. The above men found themselves and their families in the heart of Kansas in the spring of 1879 after a long and tiresome overland journey from the east. These sturdy men constituted a new settlement to be called Ast after the shortest name in the community. Through a blunder by an American post office official the name was changed to “Ost”. So overnight, Ost, Kansas was born in the extreme south-east corner of Reno County, to be as it were the thumb tack to hold down the county map. Strange as it might seem, this parish is scarcely known as Ost, but as “St. Joe” by Catholics and non-Catholics alike. When settlers arrived in the St. Joseph area they brought with them their strong religious faith. 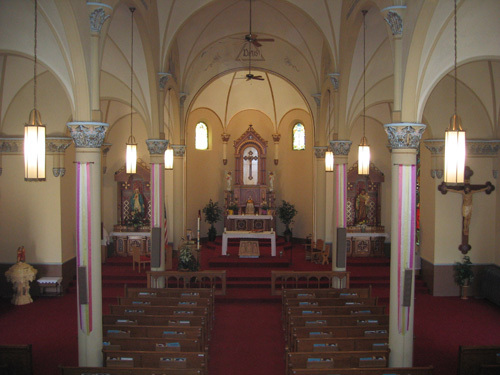 Before the St. Joseph Parish was established, Ost settlers gave proof of their Catholic beliefs by their earnest efforts to attend Mass regularly at the nearest parish, St. Marks, Kansas. This meant traveling a distance of ten miles over an uncharted territory, a long journey for those days. The oxen pulling the cumbersome farm wagons, were slow travelers. Many of the settlers walked to St. Marks every Sunday and holy day of obligation unless, of course, the weather was bad. A Catholic community as ambitious and as zealous as the Ost settlement would not be for long without a parish church of its own. The people desired, by all means, to have a priest in their midst. And as a first step toward the realization of their fond hopes the erection of a church was paramount. Accordingly, within less than a year after their coming to Kansas, the leading members of the settlement brought the agitation for a church building to fruition by announcing that a site had been chosen for the structure and that work on the building would commence at once. A committee was appointed to take charge of the building work. This beginning was made in the fall of 1879. Two generous men appeared on the scene at this particular time, one a Catholic, one a Protestant, John Ast and William Hollis. Both men were excellent carpenters. These two men agreed to build the church with free labor. This generous offer gave the church building project an auspicious start. The material, purchased in Wichita and Garden Plain, as an outlay of $700, was hauled by the parishioners to the church site, which was a half mile west of the present church site. It had been decided to build a frame church, 24 by 40 feet, with a small steeple. The small frame church structure was almost completed when many of the parishioners began to doubt the choice of the site. It was argued that the church ought to be moved a half mile east, to crown a spacious hilltop-a superb location. Besides, more church property was available there, five acres, ready to be deeded freely to the parish the moment the church was moved. To settle this question a balloting was proposed. Work on the church building was temporarily halted. The people assembled in the church building and there cast their votes. The ayes, for a new site, won almost unanimously. The proposed new church site should be accepted. And so it was. John Ast was ordered to supervise the moving of the church to the new site. This was quite a task, but successfully accomplished. Oxen, bending under their yokes, pulled the church, set on wooden sleds and rollers, to the new site. In early 1880 the church was ready for occupancy. Father Schurtz, pastor of St. Marks, celebrated the first Mass in the church. All the parishioners and very many of their friends from St. Marks were present in Ost on that memorable day. 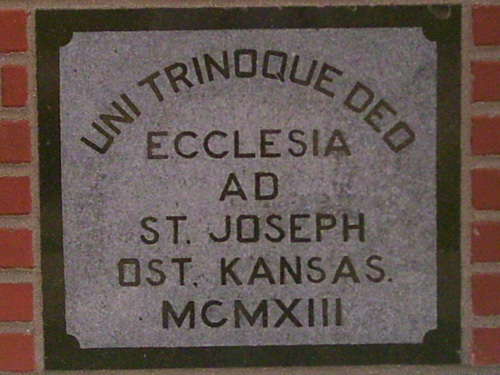 It was the first gala day in the history of the young settlement-on that day St. Joseph’s Parish, Ost, Kansas, was born. From that spring day in 1880 to the fall of 1886 the Ost parish was a mission of St. Marks. The priests who served the Ost congregation during those six years were, in the order of their coming and going: Fr. Schurtz, Fr. Krous, Fr. (the late Monsignor) Schmiehausen, and Fr. Mauer. These priests served the new mission zealously and laid well the foundations of the parochial life that fifty years later was to blossom out into one of the finest rural parishes in the Wichita diocese. The need for a resident pastor was feely mentioned towards the close of the year 1885. For one thing, the people desired church services more frequently. The pastor of St. Mark’s was a large parish, the Mother Parish of the entire neighborhood, now girdled by the following parishes: Ost, Andale, Colwich, Aleppo, and Schulte. Hence, because of the work at home, the St. Marks priest could not serve the Ost congregation as efficiently as was desired. The first rectory was built and on September 24, 1886, the Rev. Joseph Hartman was sent to Ost to become its first resident pastor. The good Bishop of Leavenworth, the Rt. Rev. Louis Fink, had favored the pleas of a troubled congregation. Great rejoicing took place at Ost on the arrival of Fr. Hartman. He was welcomed to the expectant parish by a special committee who, in the name of the congregation, promised the cooperation of all the parishioners in the work ahead. Fr. Hartman began at once the work of the completely organizing the parish. He spent two arduous years in the community, during which time he made such improvements as were necessary and as the times allowed. On April 1, 1888 the Rev. Bernard Vonderlage succeeded Fr. Hartman as pastor of Ost. This appointment was made by the Rt. Rev. Bishop Scannell of the Concordia Diocese. The Concordia and the Wichita Dioceses were officially erected in August, 1887. The First Bishop of the Wichita diocese was the Rt. Rev. Bishop Hennessy, who was installed in December, 1888. Fr. Vonderlage’s pastorate at Ost was short lived. He had been in Ost hardly two years when he was called elsewahere to be succeeded by the Rev. John Loevenich. With better times at hand, Fr. Loevenich began the building of a new church. The old church was now too small to accommodate all the people. Thus, late in 1891, Fr. Loevenich and a specially appointed committee drew up plans for a new frame church structure. It was 32 by 80 feet, almost three times larger than the first church. This church was to have a slim, tall steeple, with sufficient pew space for sixty families and with a large sanctuary boasting three fine altars. Work on the building commenced at once, and in May of the following year 1892, it was dedicated by Bishop Hennessy. Education of the Ost children prior to 1892 had been carried on in the district school, which stood not far away from the small village. This “district school,” however, was in reality a Catholic school. Both the teacher and children were Catholics. Accordingly, Catholic discipline and teaching was possible in the district school. As time went on, however, the congregation began to agitate a parochial school taught by Catholic Sisters. Fr. Loevenich, naturally, much encouraged this movement. He saw in a parochial school standing on church property and in charge of Sisters, the real making of the parish. The opportunity to establish the parochial school came when the old church building was abandoned. Why not convert it into a school building? The idea was seized at once. The little frame church was moved to the southeast corner of the church property. It was hastily remodeled and then equipped with school benches, blackboards, and the like. In September it was ready for occupancy. Two Sisters of the Sorrowful Mother, whose headquarters were at the St. Francis Hospital, Wichita, were engaged to take charge of the school. The congregation welcomed the Sisters with open arms. Their presence in the parish was another proof that their parish had “arrived”. The Sisters were housed in a small dwelling which the parish had rented for that purpose from Clement Sullentrop. Fr. Loevenich’s pastorate at Ost was terminated when he was sent to St. Mary’s Parish at Aleppo in 1895. This parish, another offspring of the mother parish, St. Mark’s, had been established some years before and had been attached to Ost as a mission. Rev. AJ Abel succeeded Fr. Loevenich as pastor of Ost. This zealous priest busied himself in promoting the spiritualties of the growing parish and in coordinating parochial school work. He also paid particular attention to the cemetery replotting a number of the lots and otherwise putting “God’s Acre” in good order. In 1897 Fr. Abel built the first school building proper. The old frame church was no longer a desirable building; it was never intended that it should serve as a school for very long. The new school, a small frame structure, with two rooms was well equipped as times demanded and means allowed. At this time also a Sister’s residence was built; a small frame building which housed the Precious Blood Sisters for many years. In 1922 a half story of two rooms was added. Fr. Abel was succeeded by the Rev. JJ Grueter in 1899. Fr. Grueter was destined to hold the pastorate at St. Joe for full nineteen years. In 1903 Fr. Grueter engaged Andrew Bogner as main carpenter to build the second rectory. In 1913 the need of a new church was admitted by all the parishioners. Whereupon Fr. Grueter and his committee planned a church structure worthwhile. The plans were drawn up under the supervision of the pastor and the contract was left to the Knoff Brothers of Andale. The new church cost approximately $30,000. It was completed in the spring of 1914. It is built of red brick, trimmed with Carthage stone. The church structure is 46 feet wide and 100 feet long, with Roman and Gothic architecture combined. Its high, slender steeple is visible for many miles around. This beautiful church was dedicated on May 3, 1914. It continues to serve as the St. Joe Parish church building still today. In 1918 Fr. Grueter was promoted to the pastorate at Colwich. He was succeeded by the Rev. J. George Herrman. Fr. Herrman would be destined to serve the St. Joe parish a full 30 years. An outstanding year in the pastorate of Fr. Herrman was 1922, when the spacious brick school building was completed and dedicated. It was dedicated by the Most Rev August J. Schwertner on December 13, 1922. This school building is still used today for multiple school functionalities. In January 1949, Fr. Leo Debes succeeded Fr. Herrman. The new pastor was officially installed on February 20th. Within a few weeks a faster pace was set in the parish as committees were appointed and plans were made for the proper celebration of the Ordination Day and First Solemn Mass, the first in parish history. The day had been set-April 18, 1949. Thus the day dawned bright and cleat and Bishop Mark K. Carroll came to St. Joe to ordain to the Holy Priesthood the Rev. Roland Nett and the Rev. Vincent Eck. Fr. Michael Lies was the narrator of the Ordination rites. The following day, both of the newly ordained priests, who had studied together in the school at Ost, at St. Meinrad Seminary in southern Indiana and finished their Theology at Kenrich Seminary in St. Louis, sang their First Solemn Masses to God’s glory and rejoicing of many souls. In 1953 major renovation and building programs were undertaken. Seeing the need of a new rectory, a parish meeting was called in early January to appoint a building committee. On a very dusty Ash Wednesday, February 18, the foundation was poured mostly with free labor from men of the parish. The building was completed by August 15 and it was blessed by Bishop Mark K. Carroll at the time of administering Confirmation on November 5th. On September 12, 1961 Fr. Debes was transferred to Arkansas City after nearly 13 years of pastorate at St. Joe. Fr. Raymond Schmidt arrived to assume the duties of pastor here. The first major project requiring attention was the construction of the nun’s convent. Fr. Debes had the basic plans drawn, but was transferred before he could implement them. Fr. Schmidt worked with a chosen committee of parish men to complete plans for the house. Construction began on the four bedroom ranch type house in the spring of 1962, and completed later in the year. In 1965 the Renwick School District was formed, and St. Joe School became a part of it. Fr. Schmidt retired in spring of 1980. Finding any history of Ost from 1980 to present has proven to be difficult. This is partially due to not having an assigned priest to the parish from 1980-1995. During this time various priests were temporarily assigned for short periods to serve the faith filled parishioners of Ost. Amongst those priests were Msgr. Quintin Malone, Fr. James Wilkinson, Fr. Robert Spencer, Fr. Andrew Kuykendall and Fr. Matthew McGinness. In 1995 a native of Ost came to serve as its temporary Administrator, although, it was destined for him to serve for 18 years in the role. Fr. Ivan Eck was a retired priest who’s home parish was none other than St. Joe, Ost. During the time that St. Joe was not appointed a pastor, Fr. Ivan stepped in and served the people during their time of need. He was very loved by the community due to his roots and knowledge of the area. Fr. Ivan lives just a few miles from Ost to this very day. Around the same time that Fr. Ivan came to St. Joe, the nuns decided that their time residing in the parish had to come to an end. The few nuns that were left were becoming elderly and could not continue to care for their home or themselves. Although it was with great difficulty, the nuns decided it was time for them to return to their Motherhouse to live out the rest of their lives. The absence of the nuns was greatly felt in the St. Joe community. In May 2004 St. Joe faced a tragedy they never have before. Renwick School District decided to close down the school. This devastated the community. Fr. Ivan quickly got to work to try and save the school. After much discussion with St. Joe parishioners and the Diocese of Wichita, it was decided that St. Joe would return to its Catholic school roots. However, the controversy was not over. When Renwick decided to close the school, they were under the impression that they owned all of the school buildings and property. Credited to much diligence, Fr. Ivan found evidence, that when the school became public under Fr. Schmidt’s pastorate, if the school were to ever close the property and buildings would be returned to the parish. Thus, Renwick was contractually obligated to return everything back to the parish, and the Catholic School was reopened the following August in 2004. In 2013, Fr. Aaron Spexarth was assigned to be the Administrator of St. Joe, Ost; St. Rose, Mount Vernon; and St. Louis, Waterloo. In 2015 Fr. Spexarth was officially assigned as the pastor of the three parishes. During Fr. Aaron’s time here at St. Joe, he began to make necessary changes in the parish to meet the needs of the time. However, Fr. Spexarth’s time as pastor was short lived. As he began to make plans for new necessities, he was transferred in spring of 2017. Following in Fr. Spexarth’s footsteps is Fr. Daniel Duling, who was assigned in June of 2017 and serves as the current pastor of St. Joe, St. Rose, and St. Louis. While he has only been here for a short time, he has begun to make his mark on St. Joe. He has already succeeded in working with various leadership from the three parishes to build a new rectory on the St. Joe campus, and works to continue what Fr. Spexarth started to strengthen the future of the parish.